Our Paris party Eiffel Tower confetti is the perfect decorative enhancements that will put sweet little finishes on your Paris themed party. 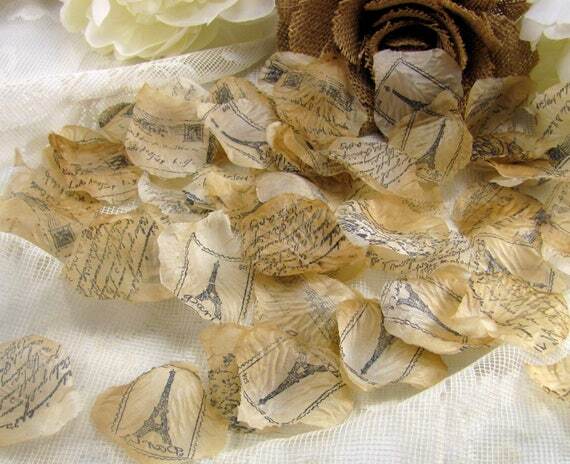 Featuring table scatter ready mix of silk petals stamped by hand with a variety of french images. Our unique table decoration confetti is perfect for decorating your tables around centerpieces for a birthday party, bridal showers, baby shower, Quinceañeras or tea parties with a Parisian theme. A wonderful addition to your party supplies you can use them to decorate your cake table, dessert bar, candy buffets, gift table, reception area or dinning tables. With each confetti piece measuring approximately 1 3/4”, and 100 petals in each bag this product will make a unique addition to your decor- be it petals for your flower girl or table decorations. Each confetti piece measures approximately 1 3/4"